Have you been thinking about adding a fence to your yard? It is a great investment. A fence not only helps improve the curb appeal of your home, a fence will also add privacy, security, and so much more to your property. The only tough decision you have to make is what type of fence makes the most sense for you, your home, and your budget. Every fence has its advantages and disadvantages. You need to find the right fence for your specific needs. What is the primary reason you want a fence? How much does style matter to you? How much privacy will you need? Do you need a fence that will help you with noise control? Do you need a fence that will protect children and pets alike? Will you be sharing your fence with a neighbor? Homeowners Association: HOAs are notorious for prohibiting fence type and placement. So before doing anything else, check with your HOA to make sure you are not wasting your time. Do the Research: Learn about the fence you want to install. Does it have more advantages than disadvantages? Does it serve your needs? Is it physically attractive? 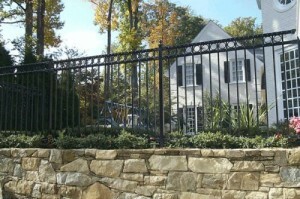 Call Hercules Fence of Northern Virginia: Since 1955, Hercules Fence of Northern Virginia has been providing professional service and quality installation for both commercial and residential fences. We pride ourselves in installing high quality fences at affordable prices. Hercules Fence is also the largest fence company based in Virginia. So why would you call anyone else? If you have any questions about Choosing the Right Fence, please contact Hercules Fence of Manassas, Virginia today by calling (703)551-2609 or visiting our website. Also, check out Hercules Fence of Manassas on Facebook,Twitter, Google+ and YouTube! This entry was posted on Friday, August 16th, 2013 at 3:41 pm. Both comments and pings are currently closed.